In the rugged Wyoming territory, the red pup is Adam’s best friend. Adam and his family live in a lonely cabin in the mountains, facing the dangers of the wilderness alone. One day, Adam¹s stepfather announces that he must leave for a weeklong trip to Cheyenne. Adam is put in charge of the family. Everything goes smoothly until three cutthroat gold prospectors come crashing into the cabin and hold the family at gunpoint. Late that night, Adam manages to escape. Unfortunately, the men let the red pup loose, and the one thing that dog does best is track Adam…Will the pup lead the men to Adam? And if he does, can Adam still save his family? 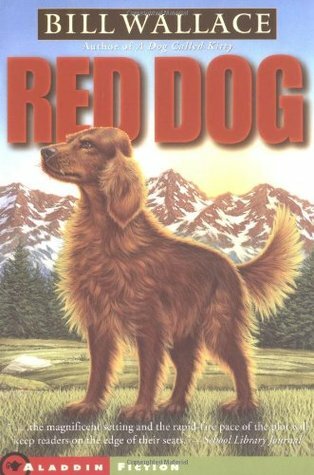 I am finally getting around to sharing my review of the last book in my Back to School series, Red Dog. Honestly, this is the perfect time of year to talk about this story, as I first discovered the works of Bill Wallace one amazing afternoon in my elementary school library. They were never assigned reading, but I read every available book by Wallace in one year (probably all before the winter break). And Red Dog is my favorite. Actually, Red Dog will likely always be a favorite! While rereading it a few weeks ago (I’m in my 30s y’all) I realized that, once again, I couldn’t put it down. I had to know what would happen to Adam and his pup, and I found myself grumbling at any distraction. So, yes this will be a glowing review. Bill Wallace had this expert way of sharing life lessons disguised as a spellbinding adventure! In Red Dog, Adam is forced to let go of childish insecurities, learn how to properly treat animals, and develop a better understanding of his changed family dynamics. The lessons are at times painful, but the writing shows readers the necessity of choosing to be a better person. This is a reminder from which everyone, both young and old, can benefit. I’m not going to share any details of the actual story, because I don’t want to ruin the reading experience. Just know that the vivid imagery and heart racing scenes will stick with you long after turning that last page. I do have a few less than positive points that sadly have to be shared. First, Adam is a royal pain for the first third of the book; whining and fighting against his mom and step-father. Thankfully, this only lasts for a third of the novel and it is necessary to show Adam’s personal growth throughout the story. Second, Wallace does not shy away from violence. Red Dog is set during the gold rush and the characters live in the Wyoming wilderness, days away from any town. Wallace does not sugar-coat the unfortunate reality that some people do not have good intentions, which results in a couple of gruesome moments. Both of these aspects mold this story and are necessary. I don’t consider them negative points, just aspects that readers should be aware of. I have lost count of the number of times I have read Red Dog. I have my own copy of the story and now, so does godson. This is the story I share with parents requesting book for their kids. Wallace was my favorite author and his stories helped shape my childhood. Here were these amazing books that offered an escape to the wilderness when I was stuck inside, and Wallace promised a grand adventure that usually included a cute dog. I blame Wallace for sparking my love of thriller and mystery fiction, and am forever grateful for finding him on that shelf. Please share you’re favorite Bill Wallace book. I would love to hear what you think of his stories. A Gentleman in Moscow is my favorite new read of 2017. 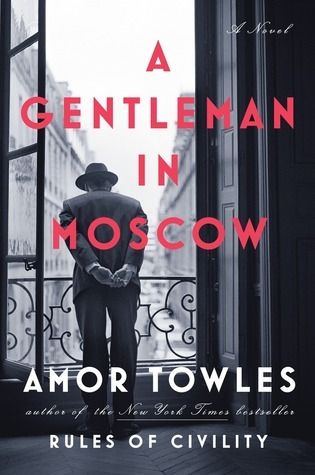 I have heard only wonderful things about Amor Towles’ Rules of Civility, which is currently sitting on my shelves waiting to be read, and decided to pick up A Gentleman in Moscow when my local library offered the audio version. And this novel will make my 2017 favorites list for sure! I’m not going to provide a summary, because the synopsis is perfect. Instead I am going to share the number one reason I adore A Gentleman in Moscow: Towles’ imagery. Even now, I can taste the Latvian stew served at Christmas and the wild honey crafted from apple blossoms. I can feel the comforting atmosphere of Alexander’s sitting room. I can hear the echo of three decades of feet clicking against the tile floor of the Metropol’s grand entry. I know Alexander’s life and Towles’ writing has painted it for me. I do not have any negative comments to share. I will state the negative points brought up by other reviewers are valid, and yet I still find myself thinking of Alexander and his life in the Metropol weeks after finishing the story. I will note that I listened to A Gentleman in Moscow on audiobook and found it enthralling. I am not sure I would have been drawn so quickly into the story if I had read the physical book. This may not have been a book about Russian history, but it has inspired me to do my own research into Russian culture. And in my ‘displaced academic’ opinion…there is no better quality in a book. Please let me know what you thought about A Gentleman in Moscow and I hope you all have a wonderful weekend! Kate Murray is deeply troubled. In front of her lies a dead man, a stranger who only minutes before had spoken to her about a mystery, a long-forgotten murder and, most worryingly, her grandmother. His story was old, he had told her, but still deserving of justice. Soon Kate is caught up in a dangerous whirlwind of events that takes her back into her grandmother s mysterious war-time past and across the Atlantic as she tries to retrace the dead man s footsteps. Finding out the truth is not so simple, however, as only a few people are still alive who know the story and Kate soon realizes that her questions are putting their lives in danger. Stalked by an unknown and sinister enemy, she must use her tough journalistic instinct to find the answers from the past in order to have a future. Hey everyone! I’m back! Thank you for being so patient during that unexpected three month break. I was having to deal with some life stuff that left little want and time for reviewing. But that’s in the past! I’m back for good, and I can’t think of a better way to jump back into the game than sharing my favorite mystery with you. So, I’m not going to provide a synopsis because I don’t want to accidentally spoil anything. However, I will share how I came to read Every Secret Thing. A few years back, I was in need of a historical mystery, and my friend, Rachel, recommended Susanna Kearsley. I browsed through her book list on Goodreads and stumbled upon this novel, which was originally published under Kearsley’s pseudonym, Emma Cole. I decided to try it out, and Every Secret Thing instantly became one of my favorite books. Every time I open these pages, I am swept along on a harrowing adventure. Every time I anxiously will Kate to find the clues and to stay alive. Every time I am swept away in the romance of New York during World War II. And every time I find myself in tears, heartbroken over Deacon’s lost love. EVERY TIME! Because Kearsley provides characters that are so well developed with all their strengths and faults that it’s hard to remember Every Secret Thing not a true story. I am completely invested in the outcome of the story. But it’s more than realistic characters that keeps me coming back. Kearsley’s descriptive settings carry you across the world. She expertly guides you on this thrilling ride and ties everything together in a way that leaves you sighing contently when you turn that last page. History and intrigue drips from every page. 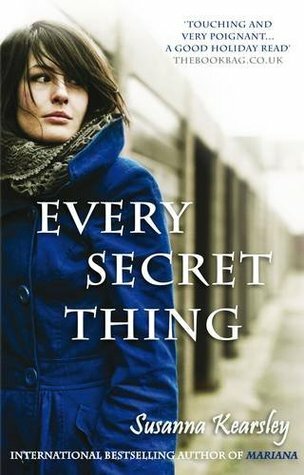 And Every Secret Thing contains the best love story I have ever read! Honestly, I can not think of anything bad to say about this story. I love it so much that I try to get everyone I know to read it. It’s been a month since I last finished it, and well, I’m tempted to read it again. I will say that I haven’t read anything else by Susanna Kearsley, so I am unable to compare it to her other work. And this may not be the book for readers wanting an over the top sappy romance, because the love story is far from the typical romance story. But I personally find that a good thing.